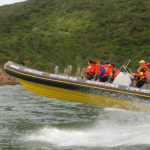 A great way to experience the unique diversity of the Knysna Estuarine. 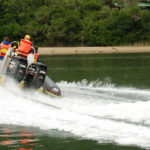 The trip will go past Ashmeads, Featherbed Bay and then exit the infamous Knysna Heads. From there you go past Noetzie, Cony Glen and back across to Brenton on Sea, Jaap se Baai and many other areas. 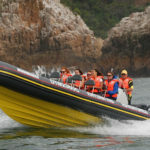 With the RIB we get up close and personal with the myriad of sea caves and grottos and you experience a closeness to this unique area that is unmatched. 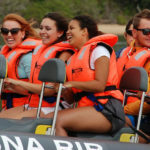 Keep your eyes peeled for the tell-tale blow of the whales as they breathe, or the large schools of dolphins that regularly come past. 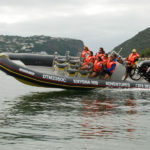 When the conditions of the Knysna Heads are unsafe, the adventure will continue down the Knysna Estuary which has its own variety of scenery. 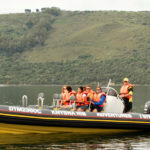 Rates: 1 hour trip – R600.00 per person and 2 hour trip – R1,100.00 per person.